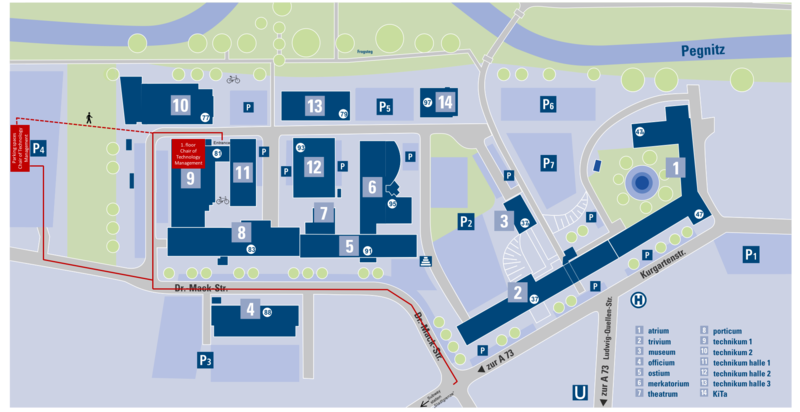 The Chair of Technology Management is located in the “Uferstadt”, Dr.-Mack-Str. 81, 90762 Fürth, Technikum 1, 1. floor. The offices are accessible via stairs or elevator. If you arrive between 08:30 am and 04:00 pm, use the white opening button (Türöffner) on the left side of the door. Please register at the secretariat after entering. In Technikum 1 you can find three rooms for lectures/seminars. They are accessible via stairs and elevator. The seminar room “Sonderborg” (room number. 01.2039) is located on the first floor, on the left side, next to the Chair of Technology Management. The second seminar room (room number. E1.2208) can be reached via the premises of the Lehrstuhls für Ressourcen- und Energieeffiziente Produktionsmaschinen (Prof. Dr. Hanenkamp). The room „Flensburg“ (CIP-Pool, room number 01.2003) is opposite of the room „Sonderburg“. Please follow the according signs. In Technikum 2, Dr. Mack-Str. 77 (opposite of Technikum 1), there are further seminar rooms. Seminar room 2.018-2 can be found on the first floor, next to the premises of the Institute of Materials Simulation (Prof. Dr. Michael Zaiser). ILI – Institut für Lern-Innovationen offers several seminar rooms, which are placed on the third floor of Technikum 2. On the Uferstadt site, there is a canteen (cash payment) called „Libertas“. You can reach it only a few steps away from the Chair in building 2. A few seminars still take place at our former location “Auf AEG”. Please find the directions to seminar room 11.2.24 here. To download the directions, please click here. Get off at station „Stadtgrenze“. Cross Nürnberger Straße and go left. Take a right into Kurgartenstraße and then left into the Dr.-Mack-Straße. You will find the “Uferstadt” on your right side. Please park your car in parking lot P4 on the parking spaces reserved for the Chair of Technology Management. 5. Pass the “Hauptzufahrt” (main access road) to the Uferstadt and turn right on the parking lot P4 after the restaurant “Zum Kütt”. Coming from south (A3, A6, A9) at “Kreuz Nürnberg-Süd” turn to A73 direction „Nürnberg/Fürth“ At the 4. departure “Nürnberg Centrum” turn right, despite Fürth is signposted straight on to “A3/A73 Würzburg/Bamberg“! The Chair is easily accessible along the riverside of the Pegnitz from both, Fürth and Nuremberg. If you take a turn from the bicycle path along the Pegnitz and cross the bridge “Quellensteg” you will be directly in the “Uferstadt”. After the bridge, take a turn right, after 50m you can see the “Technikum 1” on your left side. Bicycle stands can be found behind the wooden shed on the right side of building 10 and between building 9 and 11.